G1. With a half-life of only 5730 years, carbon-14 dating has nothing to do with dating the geological ages! Whether by sloppiness or gross ignorance, Dr. Hovind is confusing the carbon-14 "clock" with other radiometric "clocks." The only thing in the geologic record which has anything to do with calibrating carbon-14 dating is the coal from the Carboniferous Period. Being ancient, the C-14 content has long since decayed away and that makes it useful in "zeroing" laboratory instruments. It's just one of the tricks that have been used to make the work a little more precise. Radiometric Dating and the Geological Time Scale: Circular Reasoning or Reliable Tools? Andrew MacRae deals with claims that the geologic column is just circular reasoning. Unfortunately the geologists date the rocks as the paleontologists tell them to. Then the paleontologists use the geologists' dates as evidence for the age of the fossils! That's not science. That's just a game played by dishonest scientists! That passage might have come out of one of Henry Morris' books, except that Morris usually avoids crude slander. Perhaps Dr. Hovind is not aware of the fact that by 1815 the broad outlines of the geologic column from Paleozoic times onward had been worked out by people who were mostly creationist geologists. The relative order of the strata was first determined by the principles of stratification. (The principle of superposition was recognized as early as 1669 by Steno.) Reverend Benjamin Richardson and Reverend Joseph Townsend were a couple of early geologists involved in this work. By 1830 Lyell's famous textbook, Principles of Geology, came out. The captain of the H.M.S. Beagle, a very strong Bible believer, made it a point to have a copy of Lyell's book for the ship's library. Obviously, even Lyell was not pushing evolution at the time. Such was the age of the great creationist geologists! The principle of faunal succession in the geologic record was established by direct observation as early as 1799 by William Smith. By the 1830's Adam Sedgwick and Roderick Murchison established a correlation between the various types of fossils and the rock formations in the British Isles. It was found that certain fossils, now referred to as index fossils, were restricted to a narrow zone of strata. Studies done on the European continent soon demonstrated the universal validity of index fossils. That is, an index fossil corresponded to a very specific point in the geologic column. Once the worth of index fossils had been established on the basis of stratification studies, they could logically be used to extend the correlation of rock formations to other continents. At this point in time they were simply a useful tool for correlating rock formations. One can hardly accuse these pioneers of evolutionary prejudice. Nearly a half-century would pass before Darwin's book, The Origin of Species, was published! By then, the relative ages (order) of the geologic column had already been worked out in some detail. Radiometric dating would later confirm the relative ages of the strata and tie them to absolute dates. (Far from being a rubber stamp, radiometric dating would go on to revolutionize our understanding of the Precambrian.) Thus, it became possible to date strata directly from index fossils. Note that evolution has nothing to do with how the index fossils are used to date strata! Any kind of object clearly restricted to a specific point in the geologic column would do just fine. If green dice were found only in the middle Ordovician strata, they would make excellent "index fossils." Evolution should be seen as an explanation of the faunal succession, a succession which was worked out long before evolution dominated the scene. Evolution, working in tandem with geologic ages, can explain why we have index fossils, but evolution is not needed to make the index fossils useful for dating strata. Creationists, on the other hand, must explain to us how sediment and rock laid down in a mere year can yield such fantastic, orderly differences in radiometric ages. This poses a fatal problem whether one believes in the accuracy of radiometric dating or not! One would think that the flood sediments (gathered from the four corners of the old antediluvian world) and their associated igneous rock (formed during the flood) would all register very little radiometric age. At the very least we would expect random fluctuations if the radiometric methods were totally at sea. Why should the percentage of lead to uranium in zircon crystals (the key to ordinary uranium-lead, radiometric dating) depend on which geologic period they are found in? If most of the geologic column were created during Noah's flood, would it really matter whether a zircon crystal was found in Cambrian strata or Cretaceous strata, in Jurassic strata or Tertiary strata? Noah's flood might just as easily deposit the same crystal in one place as another. Thus, we have a mystery. Pressure has nothing to do with it, and zircon crystals all have about the same density as their total lead content is small. Just what is it that a Cambrian stratum has which a Cretaceous stratum lacks? What does the Jurassic strata have that the Tertiary strata do not? If rock type mattered then we would expect a zircon crystal's lead content to vary dramatically within the Cambrian or Cretaceous strata according to their local rock types. No, that's not what we observe. How about neutrinos or cosmic rays? Neutrinos penetrate the earth so easily that they would affect all strata more or less equally, to the extent that they affect anything at all. Cosmic rays, on the other hand, don't penetrate that far into the earth to begin with, so we can rule them out. The depth of burial, itself, has little to do with our mystery. In some parts of the world the Cretaceous is found deeper than is the Cambrian in other parts of the world. The depth at which either is found can vary dramatically. In the Grand Canyon area the Cambrian lies beneath a huge column of strata; in California's Mojave Desert portions of the Cambrian are exposed at the surface. For the young-earth creationist, this is an unsolvable mystery, a mystery with parallels in each of the radiometric clocks used by geologists. The potassium-argon, rubidium-strontium, samarium-neodymium, luteium-hafnium, rhenium-osmium, thorium-lead, and the two uranium-lead dating methods all point to the same amazing fact. The ratio between tiny amounts of radioactive elements and their decay products have this uncanny ability to determine which strata a rock will appear in! What is this magic ingredient that each of the geologic periods have which affects rocks and zircon crystals so? For those who believe that each of the geologic periods were laid down in days or weeks by Noah's flood, the mystery has no intelligent answer. For the rest of us, the answer is as plain as daylight. The answer to our riddle is time. The Cambrian has simply been around a lot longer than the Cretaceous, and the radioactive uranium in its zircon crystals has had more time to decay into lead. The same radioactive elements in different geologic periods will have decayed by different amounts. Even creationists realize that time is the only answer, but they give that answer a strange twist. They imagine that the radioactive elements decayed much faster in the past! Such claims are mere flights of fantasy with no basis in fact or theory (see Topic R2). Problems abound. For instance, there are many boundaries (unconformities) in the geologic strata that exhibit a sharp change in radiometric age. Thus, zircons that are formed at about the same time in Noah's flood (from intruded magma close to each side of an unconformity, if such quick formation were even possible) would exhibit impossible differences in the decay of their uranium. Figure 2 explores an additional problem that pops up when one monkeys around with the radioactive decay rates. A few calculations will rule out a fast radioactive decay rate before Noah's flood, thus firming up our intuitive feeling. Based on the present decay rate of U-238, the Cambrian period began about 570 million years ago. Since then the amount of uranium-238 has been reduced a bit (to 91.544% of itself) by radioactive decay. Had the decay rates remained high after the flood or in its later stages, the zircon crystals in the more recent strata (the last strata laid down by Noah's flood) would have "aged" considerably, which is not the case. Furthermore, the zircon crystals had to be created during Noah's flood in order to be "aged" according to the strata in which they were associated. It is too much to assume that each one just happened to be deposited in the right strata. Therefore, at the time of Noah's flood the decay rate had to be at least fast enough to reduce the amount of uranium-238 to 91.544% of itself in one year. If we generously take that minimum decay rate, with no thought of increasing it further as we look back into the past, we can calculate how much uranium-238 had to be present 1656 years before Noah's flood (when the earth was created, according to Dr. Hovind). It turns out that the amount of uranium-238 needed is 3.47 x 1063 times the amount of uranium-238 around at the start of Noah's flood! In other words, if our entire solar system were made of uranium-238 the quantity would not even begin to suffice. There is nothing like a few calculations to bring out the absurdity in creationist thinking! We may safely rule out the idea that the radioactive decay rates (for uranium-238, and, by quantum mechanical implication, all others) dwindled to their present values from high rates at creation time. An initial U-238 decay rate high enough to do creationists any good also leads to an absurd conclusion. They must now assume that the decay rates were low before Noah's flood, that they became phenomenally high during the start of Noah's flood, and that they dropped to normal after Noah's flood. Such tailor-made assumptions will impress only idiots and fanatics, and there is yet another problem worth mentioning. Some of the material that has been radiometrically dated, whose dates fully conform to the accepted ages of their place in the geologic column, come from large masses of once-molten rock. Those samples could not possibly have cooled down in the course of a mere year no matter what. (Try a million years!) Thus, any "aging" done on their interior zircons had to occur, by creationist thinking, after Noah's flood. Only then did the inner rock cool enough so that those crystals finally formed. By creationist reckoning, those crystals really formed after the flood and should reflect the normal decay rates! That is, their uranium-238 should show almost no decay at all. To the contrary, their radiometric age is in good agreement with the strata in which they were formed. Thus, even the tailor-made assumptions, to which a few desperate creationists might be inclined, come to naught. In summary of these latter points, radiometric dating has passed a severe test whereas young-earth creationism flounders, in hopeless knots, on the basic facts of the geologic record. (1) In the beginning God created zircon crystals, lots of them, from pockets of molten rock. Fresh zircon crystals are lead-free, because lead just doesn't fit in very well with their crystallization process. Many new zircon crystals, however, do contain uranium-238. Uranium-238 is radioactive and eventually decays into lead, which is trapped in the zircon crystal. Here, we see fresh zircon crystals that have formed in the newly created earth. Their uranium-238 has not yet decayed. All the rock here is Precambrian. 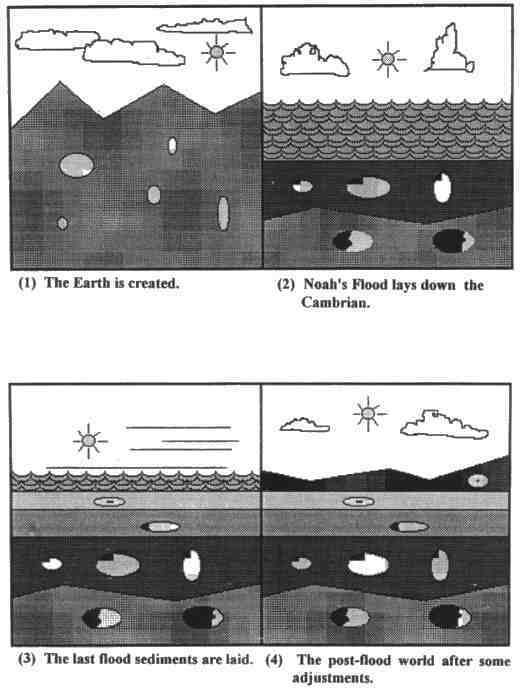 (2) Noah's flood lays down the Cambrian (dark) strata. Molten rock intruded into the Cambrian strata, and new zircon crystals somehow formed quickly at that time. Today, about 8.5% of their uranium-238 has decayed away. Many creationists say that the radioactive decay rates were once much greater than they are today. (3) Noah's flood lays down its last sediments. Notice, in each of the succeeding layers, that the zircon crystals formed have lost less and less of their uranium (as measured today). The radioactive decay rate must have been dropping fast! (4) Today's world. Mountains have pushed up, the polar caps have formed, and various other adjustments have happened. Those zircon crystals that formed right after Noah's flood show practically no loss of uranium-238. Strange, this last stage represents about 4,400 years (out of 6000+) by creationist reckoning and, yet, the uranium in its zircon crystals is essentially intact! Perhaps, by the time Noah's flood started, the decay rate had started to slow down dramatically. As the last sediments were laid down near the end of the year-long flood, that rate must have all but stopped compared to its primordial speed. But wait! If the decay rate only started dropping at the time of the flood, then it s should have done a job on those Precambrian zircons. If 8% of a zircon's uranium was lost during just the Cambrian (after which the decay rate must drop rapidly), then there shouldn't be any uranium left in those Precambrian zircons! After all, radioactive decay has had only a fraction of a year (at its full strength) to work on the Cambrian crystals; it has had up to 1656 years to work on those Precambrian crystals! Yet, they still have a fair amount of uranium. That means the radioactive decay rate must have been feeble before Noah's flood. It then skyrockets at the start of Noah's flood and drops dramatically even as that flood rumbles on! We might imagine a radioactive decay rate that was extremely high in the uncertain past, one that has dropped to normal values via some sensible curve. However, to imagine a rate that skyrockets from near-normalcy to extreme values just as Noah's flood gets underway, one which then decays precipitously only to suddenly level off near its present value, is clearly a case of special pleading. If we should forget ourselves and let this point slide, we still have all that radiation being released in a fraction of a year, radiation that conventional geology attributes to billions of years! In case you missed the point, that means the radiation would have been billions of times more concentrated than today! Noah and crew would have fried in one, giant nuclear reactor!! There is, of course, still the minor matter of explaining in detail how molten rock might be injected into sediments raining out of Noah's flood while leaving the patterns actually found. Also, decent zircon crystals could hardly form if that molten rock cooled too quickly. The alternative is to imagine that those zircons were formed elsewhere and just happened to sort themselves out during the flood, and that they just happened to deposit themselves into the right strata to give the appearance of successive ages! Dr. Hovind (G3): The fictitious geologic column (invented in the 1800's to discredit the Bible) does not exist anywhere in the world except in textbooks. G3. Oh, sure, those early creationists invented the geologic column to discredit the Bible! That just makes loads of sense, doesn't it? Is it possible that Dr. Hovind, who taught earth science for 13 out of his 15 years as a high school science teacher, doesn't understand the concept behind the geologic column? The thought boggles the mind! On top of that, Dr. Hovind is simply wrong in his claim that no place on Earth has a full set of representative strata. Showing that the geologic column is fully represented in various places is not my main concern here. Far more important is Dr. Hovind's fundamental misunderstanding of the geologic column, which seems to be shared by many creationists. The geologic column is an ideal, complete, chronological reference frame that defines the status of those strata having (more or less) a worldwide distribution or correlation in time. For example, local strata that can be traced to places where it lies above strata of the Mississippian Period, and to other places where it lies below strata of the Permian, or which can be dated or identified as belonging to that interval, is defined as belonging to the Pennsylvanian (American) or Upper Carboniferous (European) Period. Of course, we are assuming the usual order here. Allowances must be made for overturned strata, etc. In the geologic column (American version), the Pennsylvanian Period is the sixth period in the Paleozoic era and is characterized in many places by great coal-, oil-, and gas-bearing deposits. It contains the record of the first reptiles, etc., etc. The geologic column is like a yearbook with the pictures of all the graduating students in it. No one expects that every one of those students will show up for a particular dance! Neither does the geologist expect that some locality must exhibit all the known strata. The point is that the earth's strata has a very definite chronological order to it, and that order, taken at its most complete, ideal form, serves as an abstract reference frame for defining the actual strata of each locality. The question as to whether some locality has all the periods in the geologic column is only of academic interest; it has no bearing on the fitness of the concept. That is usually what is meant when one refers to the geologic column. If not that, then the phrase is simply being pressed, rather loosely, as another name for the strata of some locality or localities. Hovind (G4): Poly-strata fossils, missing layers, layers out of order, misplaced fossils, and layers in reverse order all invalidate the geologic column. G4. None of these charges amount to a hill of discarded beans. We can't examine every such claim, but we can look at a few examples. Two FAQs on false creationist claims about "polystrate fossils." By this, Dr. Hovind means fossils which cross several strata. Usually that means fossilized, vertical tree trunks. Creationists are attacking a straw man. No geologist claims that every little stratum requires thousands of years to be laid down! The strata associated with polystrate fossils invariably show evidence of relatively rapid deposition. 'Polystrate' trees show every sign of extremely rapid burial, generally when rivers flood over their banks. An example of this very thing is given by Dunbar and Waage (Dunbar & Waage, 1969, p.52). They show a photo of the Yahtse River area in Alaska, which depicts a number of upright, broken-off stumps stripped of most of their branches. The taller stumps poke out above the alluvial mud. This is the result of natural processes accompanying river course change. A couple of pages later we find a photograph showing how trees can be buried fairly quickly in another way. In this case, volcanic ash has partially buried a forest whose trees are mostly reduced to broken-off stumps stripped of their branches. Continuing volcanic eruptions over a period of years (dead trees last a long time!) and the interaction with wind would create variations in the strata which finally bury the stumps. In some cases, burial might well be less than instantaneous. In the San Francisco area fossils of cedar and redwood (dated at 23,000 years) are found in place 20 feet below present sea level. This may be due to a rising sea level from melting ice-caps. (Encyclopedia Americana, 1978 Annual [Geology].) A similar find exists off the coast of Japan where remnants of a forest of willows and alders are found in 70 feet of water. They are some 10,000 years old (Chorlton, 1984, p.90). Thus, we have polystrate fossils in the making, without the aid of Noah's flood. ...it is logical to conclude that the Lompoc diatom beds were deposited naturally on the ocean floor, and that sometime before the period of tectonic activity which finally raised them to an elevation above sea level the earthquakes in that area triggered at least one large sediment slide and flow which overwhelmed and buried the animals that were down-slope from where the slide began. As pointed out in the early parts of this section on rapid burial, we now know of large sediment flows in various parts of the world which apparently had all of the characteristics necessary for overwhelming and burying both swift and large marine animals. Thus, the mystery of Lompoc poses no problems for standard-brand geology. However, we can do even better. Thanks to that modern wonder of wonders, the Internet, a complete accounting of the Lompoc whale mystery is only keystrokes away! Darby South has thoroughly researched all the details at <http://www.talkorigins.org/faqs/polystrate/whale.html>, a web page devoted to just that subject. His material comes directly from those folks at the Los Angeles Museum of Natural History who were involved in the excavation. The original source of our story appears to be K. M. Russel, who wrote an article in Chemical and Engineering News (Oct. 4, 1976). Some "facts" were wrong from the start. To begin with, the whale fossil was not buried vertically. The angle was more like 40-50 degrees from the horizonal. Most importantly, the skeleton lay parallel to the bedding plane, meaning that the site was, more or less, once a level sea floor. The discovery of hardground‡ horizons within this strata make it clear that for long periods of time this was, indeed, the ocean floor and not a quick load of sediment from Noah's flood. The fossil was buried by the same kind of diatomites that accumulated in deep bays and basins along the Pacific Coast during Miocene times. These sediments lack any sedimentary structures that would indicate catastrophic deposition. Rather, the strata exhibit laminations indicative of slow accumulation on an anoxic bay bottom. Indeed, a partially buried, fully connected (articulated) whale skeleton is slowly being buried even now off the California coast! It was discovered about 10 years ago by a deep-sea submersible. Plate tectonics wrote the final chapter. As the Transverse Ranges were being folded and pushed up, the sea floor on which our whale had settled and, in time, had been buried, was now subject to folding. As a result, that whale skeleton became tilted along with the strata on which it lay. Now that we have the real facts, we can see that this whale fossil is actually a good reason for rejecting Noah's flood as the source of the geologic column! Funny, how creationists often shoot themselves in the foot while trying to attack conventional geology! In order to collect the point, creationists must show that polystrate fossils exist where they shouldn't be. That involves a lot more work than conjuring up interesting pictures and local stories accompanied by much speculation. Missing layers are no problem at all once one understands that the geologic column is an abstract conceptual tool, an ideal reference frame, which gives order to the overall geologic record. It's like a dictionary listing the more important English words. No one expects that every one of those words will be present in some history book! Neither does the geologist expect any particular locality to exhibit all the known strata. Has it occurred to you that the thick strata now being formed in the oceans off our coasts are not forming on the mainland? Thus, we have one cause of our missing strata, namely that it might not have been laid down in the first place! The late Jurassic, for instance, was not laid down everywhere; where land existed no sediment was being added, except in lakes, dune accumulations, and in certain other situations. Another possibility is erosion. Given enough time, erosion will strip away exposed strata. Large parts of Canada have been, with the help of glaciers, stripped all the way down to the Precambrian rock! Talk about missing layers! Again, missing strata present no problem for geologists. The geologic column has no missing strata because it is a catalog of all known strata; it is not a physical locality but a chronological compilation of all localities, an ideal reference frame. A great many of creationist claims on this matter are related to thrust faults. A geologist shows what is wrong with them. Information about the most famous thrust fault and creationist claims about it. "Overturning of strata is associated with intense folding in tectonic belts formed by continental collision." (Strahler, 1987, p.384) Anyone who makes the most elementary observations of mountain strata will note a high degree of folding. Anyone who has studied a decent geology text, a result of numerous years of careful work by thousands of trained geologists who made numerous field trips to assorted mountains and valleys in order to chip away at the earth's old rind, will appreciate just how messy things can get. Nevertheless, except in the very worst cases of mangled rock, there is almost always a pattern to it which holds the key to its history. The Grand Morgon in the French Alps, for instance, has a recumbent fold giving a strata sequence like D-C-B-A-B-C-D. Common sense suggests that the strata have been folded, and careful mapping bears that out. Footprints, mudcracks, ripple marks, cross laminations, and various other clues found on the surfaces of bedding planes often confirm beyond any shadow of a doubt that a given sequence of strata have been overturned. A strata sequence of B-C-A-B-C, to give another example, suggests that the strata A-B-C had been shoved upon itself after breaking along a front, and that stratum A- had eroded away. A geologist studying the site would look for evidence of an overthrust at the boundary of C-A. To hear creationists complain, you'd think the strata were shuffled like a deck of cards without a clue as to which way is up! Far from it! A careful mapping of an area is usually enough to unravel the mystery or at least point to a likely solution. Strahler (1987, Chapter 40) provides an excellent discussion on the nature of overturned strata, including a thorough discussion of the Lewis Overthrust. When geologists look at areas which haven't been seriously disturbed for great ages, such as the Grand Canyon, they always find the strata in the right order. Some strata may be missing, but the order will be correct. Such studies soon made it abundantly clear to the early geologists that the earth's strata has a very specific order. Thus arose the concept of the geologic column. Let me also add that radiometric dating supports only one order for the geologic column, the same order found in undisturbed areas. Radiometric dating, where applicable, also clearly identifies reversed strata and other anomalies. Such anomalies, as already noted, can often be identified by extended mapping of an area. More evidence illustrating the correct order of the geologic column may be had by mapping the bottom sediments of the Atlantic Ocean according to their geologic ages. If we move away from the Mid-Atlantic Ridge, either towards the United States or North Africa, we move successively from the recent sediments of the Quaternary period to the Pliocene, Miocene, Oligocene, Eocene, and Paleocene epochs, which make up the Tertiary period, to the late, middle, and early Cretaceous periods, and finally into the late Jurassic period just beyond the continental shelves of either coast (McGeary and Plummer, 1994, p.79). The fact that these sediments are in perfect textbook order is hardly surprising since the Atlantic sea floor has been continually spreading apart since the late Jurassic. As new sea floor emerges and spreads outward it picks up the most recent sediment, which means that the farther away we look from the Mid-Atlantic Ridge the older the sediment is in the bottom layer. We should, therefore, find the whole textbook sequence (as far as it goes) in its proper order as the sea floor is a perfect place for the continuous deposition of sediment, and that is exactly what we do find! A similar story holds for the East Pacific Ridge, which runs roughly south of central Mexico. If we move northwest towards the Marianas Islands (south of Japan) we cross the same order of geologic epochs and periods as we did in the Atlantic! Again, this is not surprising since the Pacific sea floor is spreading out from that ridge, meaning that it would also record the true order of sediment deposition. Naturally, it will agree with the order found in the Atlantic. Further confirmation, if needed, can be found in the Mid Indian Ocean Ridge (McGeary and Plummer, 1994, p.79). There is really no question whatsoever as to the proper order of the world's major strata. It is a sign of sheer desperation that today's creationists would even try to challenge such a solidly established fact as the geologic column. Glen J. Kuban discredits Carl Baugh's hammer. Includes images of the hammer. Kuban's detailed and look at the Paluxy River tracks. Yet another alleged out-of-place artifact is debunked. The text of the 1986 Robert Schadewald article which the author cites in this section. The creationist claim of misplaced fossils, i.e., fossils (or manufactured items) in the "wrong" strata, is scarcely more than a collection of dime-a-dozen rumors that are completely lacking in scientific documentation. The one, shining exception, the supposed man-tracks along the Paluxy River in Texas, which had enough "substance" to be the subject of a creationist movie, has proved to be an embarrassing bust. It is an embarrassment to all but the most die-hard, head-in-the-sand creationists. A thorough discussion of all the claims for "misplaced" fossils and manufactured items would fill an entire book. We can only scratch the surface. Carl Baugh's hammer: This hammer was supposedly dug out of Ordovician strata. In fact, it is a 19th century miner's hammer of recent American historical style. Carl Baugh is something of an embarrassment even to creationists in that he is continually finding things in the Paluxy River area which just ain't so! Perhaps you've heard of "Glen Rose Man" which was created from a fish's tooth! That was one of Baugh's productions. As for the hammer, which was actually found by others near London, Texas in the 1930s, supposedly in an Ordovician stone concretion, it merely came into Baugh's possession. The stone concretion is real, and it looks impressive to someone unfamiliar with geological processes. How could a modern artifact be stuck in Ordovician rock? The answer is that the concretion itself is not Ordovician. Minerals in solution can harden around an intrusive object dropped in a crack or simply left on the ground if the source rock (in this case, reportedly Ordovician) is chemically soluble. This is analogous to stalactites incorporating recent objects in their paths as they grow. The rapidity with which concretions and similar types of stone can form is evident in soil caliche development. "Rapid formation of limestone has been shown in coral atolls in the Pacific where World War II artifacts have been found in the matrix" (McKusick and Shinn, 1980). Given the above data, evolutionists are scarcely troubled by Carl Baugh's hammer. Paluxy River Footprints: For years creationists claimed that human footprints could be found side by side with dinosaur prints at this site near Glen Rose, Texas. The complete story of creationist doings in and around the Paluxy River is, with one or two notable exceptions, a classic study of wishful thinking gone awry. Few studies shed more light on the creationist mentality than does the history of the Paluxy River "mantracks." Richard Tierney (1986) captures some of the flavor of that story which is too long to tell here. A running account can be found in various issues of Creation/Evolution. There was even a seductive creationist movie, Footprints in Stone, which "documented" the "mantracks" found along the Paluxy River. Laurie Godfrey (1981) showed that the film was pseudoscientific. The "man prints" in the film had been darkened, with either shellac or oil, making them look far more human than they would have otherwise (Godfrey, 1981, p.24). In some cases the "man print" was a portion of a larger footprint which was probably made by a dinosaur. "In other cases the shellac seemed to connect erosional depressions." (Godfrey, 1981, p.24). One of Godfrey's students wrote to Eden Films to ask whether or not duplicates of their casts could be purchased for firsthand examination. Their answer was "no, not yet," leaving Laurie Godfrey wondering "Why not yet?" Perhaps a careful examination of such casts would have exposed the wishful thinking, expressed in shellac outlines, that went on. Dr. Coombs, a vertebrate paleontologist who has studied dinosaur tracks, and Dr. Gomberg, an expert on the anatomy of the primate foot, both watched the film and concluded that they saw no genuine human tracks except those made during a modern demonstration. They concluded that some of the prints shown were genuine in the sense that some kind of animal made them, but the details from the film were too poor to draw any conclusions. It is fortunate that some Texas paleontologists have examined firsthand the Glen Rose tracks. Wann Langston, Jr., pointed out that some of the "man prints" have distinct claw marks emanating from what the creationists call their "heels." (The creationists apparently reversed the direction of travel for these critters.) Langston also noted that one of the most widely reproduced footprint photos of Paluxy man shows a portion of a poor print of a tridactyl dinosaur; this may be clear, however, only to someone who, having studied the anatomy of the dinosaur foot, knows what to look for. Milne  makes the same point using photographs of in situ "man prints" taken directly from creationist literature. These "man prints" are nothing more than dinosaur toe impressions, selectively highlighted, with sand obscuring places where the rest of the dinosaur's foot might show. ... The existence of claw marks on some of the best series of "giant man prints" is now acknowledged by creationist John D. Morris, son of Henry Morris and author of Tracking Those Incredible Dinosaurs and the People Who Knew Them. This includes the McFall track, which is shown in Footprints in Stone. After commenting on the film's unbalanced testimonials from supposed "experts," a group of commentators that did not include a single vertebrate paleontologist or paleoichnologist (an expert on the tracks of extinct critters), Laurie Godfrey concluded: "In short, the film is a distorted pseudodocumentary, which belongs in the realm of science fiction rather than science." Before long others had visited the site. Issue XV of Creation/Evolution is devoted to the Paluxy River footprints. In it the studies/reports of R. J. Hastings, L. R. Godfrey, J. R. Cole, and S. D. Schafersman are devastating. "Man tracks" turned out to be erosional features and partial dinosaur prints. A study of stride length added additional support to the obvious. Nor has previous paleontological studies of the area offered any hope for creationists. Fossils typical of the Cretaceous were found in the Cretaceous strata. Mammoth remains were found above that strata in recent deposits, but never embedded in the Cretaceous. The Ryals Trail, the McFall site, Taylor's Trail, and other items were examined and discounted as human trackways or footprints. The details of these studies are too numerous to repeat here. In September of 1984 Glen Kuban and Ronnie Hastings noticed that coloration patterns, due to secondary infilling of the original depressions, patterns previously noticed on only some of the Taylor site tracks, now appeared on tracks of all four alleged human trails. The coloration clearly brought out the dinosaurian nature of the "human" footprints! A few creationists became so hysterical that they actually hinted that evolutionists might have painted in these markings! Taylor was so impressed with Kuban's guided tour of these problems that he withdrew the film Footprints in Stone from public circulation! (Schadewald, 1986, p.6) The Institute for Creation Research halfheartedly backed off without giving Glen Kuban any credit for his work, which blew the lid off the whole affair. (Schadewald, 1986, p.7). In the March 1986 Acts and Facts, an anonymous author (presumably Henry Morris) defends John Morris' half-hearted retraction in an unapologetic apologetic. Regarding John Morris' hints about fraudulent colorations, the anonymous author of "Following Up on the Paluxy Mystery" notes that "no evidence of fraud has been found, and some hints of these dinosaur toe stains have now possibly been discerned on photos taken when the prints in question were originally discovered." Glen Kuban, who pointed out these colorations in the early photos, is not mentioned at all. Indeed, the original creationist interpretation of the trackways is characterized as "not only a valid interpretation but arguably the best interpretation of the data available at that time." The "close-minded" evolutionists who have criticized the Paluxy tracks are mentioned only with sneer and smear. Another creationist organization with a heavy stake in the Paluxy River footprints is the Bible-Science Association. The Reverend Paul Bartz, editor of the Bible-Science Newsletter, has hotly defended Footprints in Stone and editorially sneered at the work of the "Raiders." After Films for Christ withdrew Footprints in Stone, I watched the Bible-Science Newsletter for a reaction. Nothing. The BSA headquarters are in Minneapolis, and BSA officials are active in the Twin Cities Creation-Science Association. I attended TCCSA meetings to hear what the BSA had to say in that forum. Nothing. I privately showed BSA field director Bill Overn an unpublished manuscript on the tracks. About a month later, the BSA finally broke its silence. The colorations provide strong confirmation that all the trackways on the Taylor site are dinosaurian. Even before these colorations became more prominent, the tracks did not merit a human interpretation. The upshot of all this is that many creationists, at least the more sophisticated ones, have had the good sense to abandon this argument. (Hopefully that includes Dr. Hovind.) The die-hards, of course, continue to dream of finding their Holy Grail along the Paluxy River, a find which will magically banish evolution along with 120 years of scientific study. I wouldn't be a bit surprised if a few of them are still poking around the Paluxy River even today. Thus, from time to time, we may expect pathetic attempts to rejuvenate the Paluxy River juggernaut which had sunk of late. Stay tuned! Trilobites and Humans: Dr. Hovind has a slide of a trilobite which was "stepped on" by a human! This looks suspiciously like one of the bogus Meister tracks (Conrad, 1981, pp.30-33). Mr. William J. Meister's specimen, found in 1968 near Antelope Springs, Utah, was offered as evidence that a trilobite was stepped on by a human wearing a boot with a heel. In a 1973 debate Reverend Boswell claimed that it had been tested by three laboratories around the world! Sounds pretty impressive, huh? In fact, it is nothing more than a slab of Wheeler shale that has a fragment spalled off in the form of a footprint, which reveals a trilobite, Erathia kingi. To fully appreciate that fact, which has been established beyond any reasonable doubt, you should read Conrad's account. Creationist Explanation, Kofahl and Kelly Segraves suggest that the above fossils were relegated to dusty museum closets and forgotten because they didn't fit the evolutionary scheme. Scientific Creationism, one of Henry Morris' classic works, states that the Castenedolo and Olmo skulls were found in undisturbed Pliocene strata in Italy. The Bible Science Newsletter had this to say (from: Conrad, 1982, p.15). The bones from Castenedolo, near Brescia in Italy, belong to several skeletons of men, women, and children and were found on various occasions in a shelly bed of sand and clay, of marine origin and of Pliocene age. In 1899, the discovery of a new human skeleton was the subject of an official report by Professor Issel, who then observed that the various fossils from this deposit were all impregnated with salt, with the sole exception of the human fossils... It seems certain that at Castenedolo we are dealing with more or less recent burials. Ernest Conrad goes on to inform us that in 1965 collagen tests demonstrated "that the Castenedolo materials were intrusive burials into the Astian clays." Radiocarbon dating in 1969 by the British Museum placed the cranial fossils in the Holocene. We're dealing with relatively recent fossils and they present no problem for evolution. In the case of the Olmo materials, the creationists are in error from the beginning. The Olmo skull fits perfectly into the evolutionary chronology and is a legitimate specimen, for here we find a modern skull cap in upper-Pleistocene gravels--exactly where it ought to be. Based on various lab tests developed by the British Museum, it was determined that the Olmo skull was probably from the upper Pleistocene. It was relatively old, but it presents no embarrassment for evolution. It came from the Upper Paleolithic cultural period. The Calaveras skull turned out to be a hoax! If you wish to read the details, see Conrad (1982, pp.17-18). Thus, Morris, Kofahl, and Segraves were taken in by a hoax! Take note, those of you who speak of Nebraska Man! Neanderthal Man in Louisiana? : Why is it that skeptics like to see such claims documented in good, scientific journals? Take the case of the 11-foot Neanderthal Man, whose fossil was supposedly unearthed in Louisiana. This case, which was researched by Paul V. Heinrich, was sent to me by Ed Babinski via the Internet. A gravel contractor unearthed parts of a human skeleton 35 feet from the surface of the ground and an LSU geologist said today the bones may be prehistoric. ... J. W. West, of LSU and several student scouts viewed the bones but called their finds too inconclusive to make an official statement. Sicily Island, Jan. 9, (UP) - Anthropologists and geologists studied today a collection of bones from a gravel pit that may show that the Neanderthal Man - an 11-foot tall ancestor of modern man - lived in North America about 50,000 years ago. Thus, we seem to have evidence for 11-foot giants roaming about Louisiana as documented by bones from the Plio-Pleistocene Citronell Formation within Louisiana. Unlike similar creationist stories, which are often extremely vague, this account comes with details. The specific geological formation is identified along with at least one of the scientists involved. We are even told that the site is about 5 miles west of the small town of Sicily Island. As Paul Heinrich noted, "Had the bones not been donated to and catalogued in the LSU Museum, another anomalous fossil human skeleton would have appeared on the scene." Creationists would have had a field day! "... shows like 'The Mysterious Origins of Man' and books like 'Forbidden Archaeology' would have had an example of 'human remains' of Plio-Pleistocene age being found in Louisiana and ignored by myopic paleontologists and archaeologists." As it happened, those bones were donated to the LSU Museum and catalogued. Several years later they were examined in detail and proven to be those of a bear (Arata and Harmann, 1966). The newspapers and wire services lost interest and dropped the story. Newspapers are written to entertain their readers, not to set facts straight. Dr. Hovind (G5): The assumed age of a sample will dictate which radiometric dating method is used. One method will only give results for a young age; another will only give results for a very old age. Thus, the assumed age of a sample dictates the method which, in turn, gives the assumed age! G5. That seems to be Dr. Hovind's complaint, one that has been made by other creationists. Are we to believe that the world's leading geologists cannot recognize an elementary case of circular reasoning? Is that the real explanation behind their choice of isotopes in radiometric dating? Of course not! Those creationists arguing thus have been grievously blinded by their religious prejudice, against which even a Ph.D. is no defense. The problem lies with Dr. Hovind and many other creationists who haven't the foggiest idea how radiometric dating works! They are the last people who should be criticizing it. The explanation is so easy that quotations from specialists won't even be necessary. If you test an old sample with a radiometric method geared to young samples, you would find that all the "parent" radioactive atoms have decayed. Your conclusion would be that the sample has a minimum age which corresponds to the smallest amount of the "parent" nuclide you can detect. You would not conclude that the sample was "young." If you test a young sample with a radiometric method geared to old samples, you would find that none of the "parent" radioactive atoms have decayed. Your conclusion would be that the sample has a maximum age which corresponds to the smallest amount of the "daughter" nuclide which you can detect. You would not conclude that the sample was "old." The realities of the laboratory, of course, mean that there are no sharp cut-off points. Instead, there will be ranges, and at the extremes the results can only give a rough maximum or minimum age. Dates landing in that zone would be considered unreliable. It's a little like weighing a flea on a truck scales or weighing a brick on a scales designed to weigh envelopes. If the brick depresses the envelope scales all the way to the highest mark, you conclude that the brick weighs at least that much. If the flea doesn't depress the scales at the truck stop, you conclude that it weighs less than a weight which barely moves those scales. Consequently, the choice of scales will not dictate the result. Of course, if the truck scales isn't perfectly calibrated, you might get a 50-pound flea! Similarly, the envelope scales would indicate that the brick only weighs a few ounces. However, no one who is familiar with such scales would take those readings too seriously. A similar situation holds for radiometric dating. Readings falling in the minimum or maximum zones are not taken too seriously. Thus, there is no problem.